• Construction began at 7 a.m.
• Finished removing sidewalk along east side of H Street. • Bill Sheppard placed water line to south side of 10th Street. Tomorrow (Friday), H Street will be closed from 11th Street to 9th Street to allow the placement of water lines and water valve cluster in the 10th Street intersection. 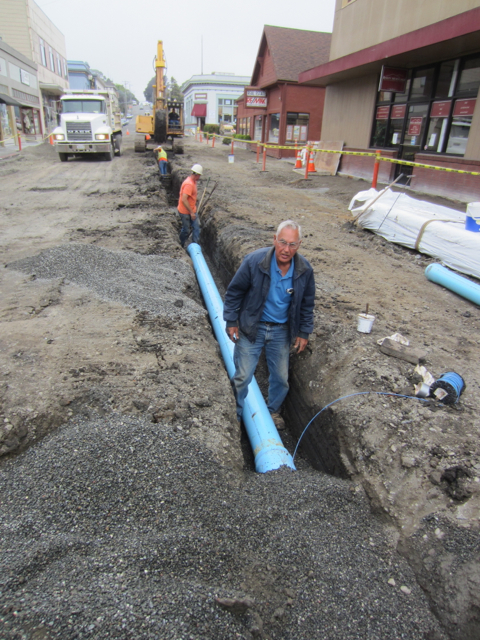 Kernen Construction will begin grading for new concrete next to Arcata Liquors. This entry was posted on Thursday, September 8th, 2011 at 1:36 pm	and is filed under News. You can follow any responses to this entry through the RSS 2.0 feed.